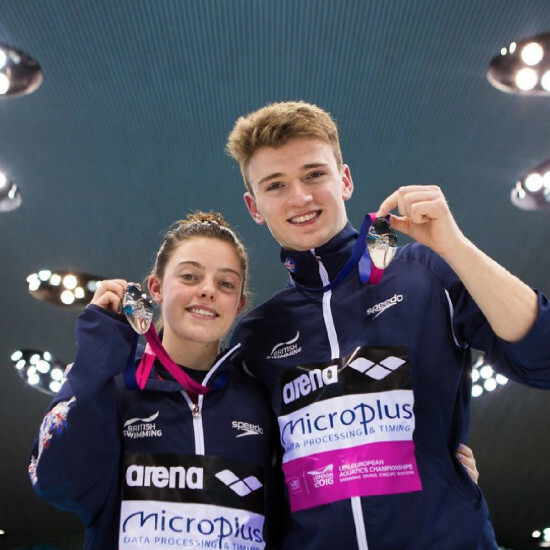 The LEN European Aquatics Championships 2016 was the main continental aquatics meet on the world stage, bringing together top athletes across Swimming, Diving and Synchronised Swimming, held at the London Aquatics Centre, Queen Elizabeth Olympic Park. This event provided a real opportunity to see World Class athletes in action in an iconic Olympic venue; and what a venue! Designed as a centrepiece for London 2012 by Zaha Hadid, the Aquatics Centre was “inspired by the fluid geometry of water in motion”. The design features a stunning roof form that sweeps up from the ground like a giant wave to enclose the pool. The liquid drama of the roof also dominates the interior of the venue so it’s like swimming in a spaceship. The event inspired record Team GB medal performances in advance of the Rio Olympics in the summer; Tom Daley secured diving gold, while Matty Lee and Georgia Ward secured silver in the Synchro finals (pictured). 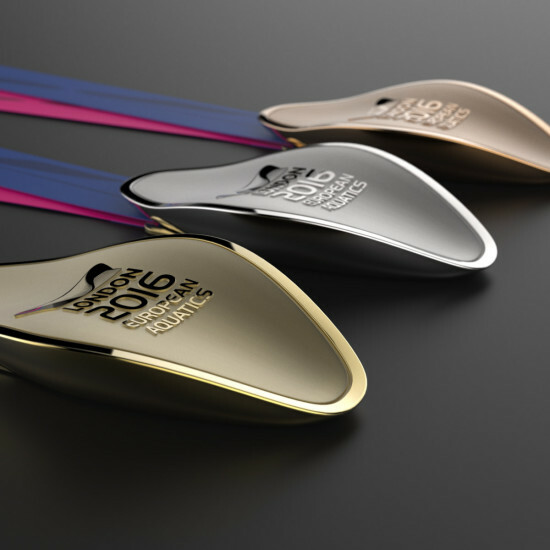 The medal design was acknowledged by the organisers as “one of the finest they have seen in any competition, perfectly capturing the ambitions of the event in London”. 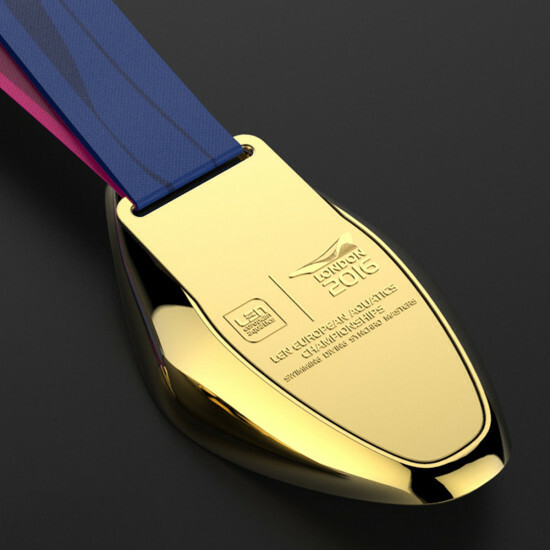 In all, we designed and delivered bronze, silver and gold medals for both the Elite and Masters competitions, along with the Elite Championships Trophies for Swimming, Diving and Synchronised Swimming. We also created a commemorative medal and pin badge designs for merchandising at the venue and online. 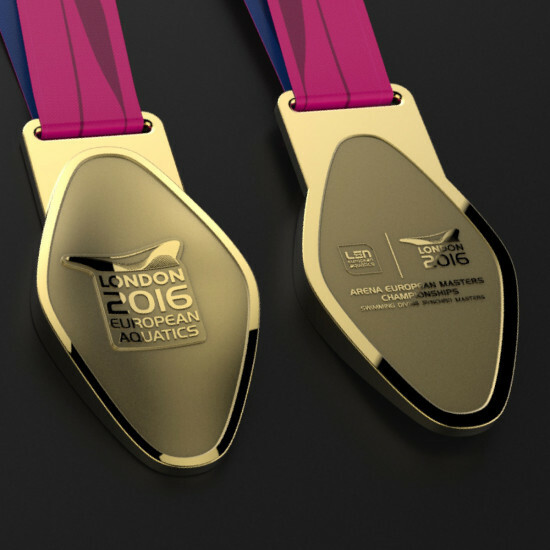 From the outset, we wanted to create a medal with a unique appearance that would celebrate hosting the Championships in London. As the event would be held entirely at the London Aquatics Centre, it seemed right to take this stunning venue as our inspiration. The medal body is in the form of a double curvature rhomboid (more commonly known as a ‘pringle’), which displays a complex set of curves that look fantastic when polished and plated. 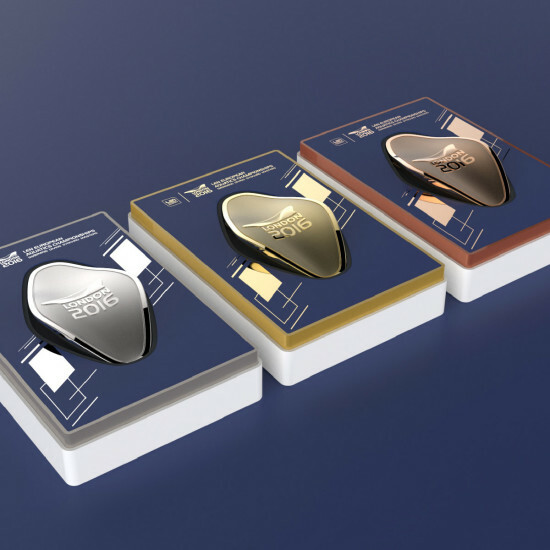 To achieve this sophisticated 3D form the medal had to be manufactured as a precision die casting in zinc, a heavy alloy that plates beautifully, adding to the premium look and feel. To preserve the full curvaceous form of the medal with no compromise, it was necessary to conceal the ribbon attachment at the rear. To do this, the medal is constructed in two halves to create a clean, premium look with no apparent visible means of ribbon attachment from the front. The ribbon bar is inset at the rear with a contrasting satin plated finish and features the LEN mark. The ribbon itself is printed with a repeat pattern motif of the stadium silhouette on pink and blue tournament colours. The design of the presentation box went through a number of iterations. 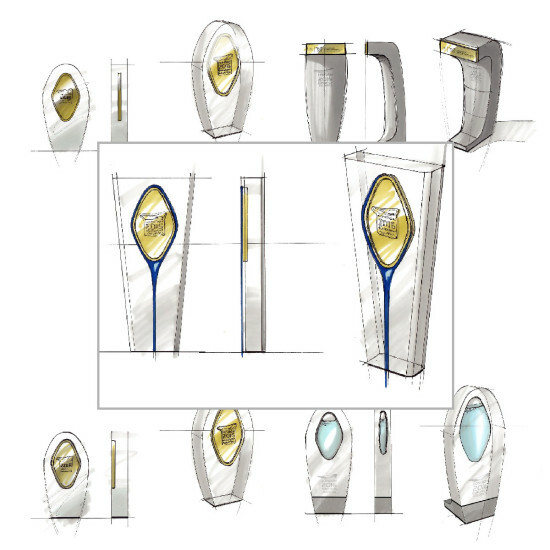 This early concept, a white shoulder box featuring a smart gold, silver and bronze block foiled liner, was developed to tell the story of the medal development. The Arena European Masters Championships 2016 saw swimmers, divers and synchronised swimmers from across the continent compete in London. In a historic first the Masters event was held together with the elite Championships to form the LEN European Aquatics Championships 2016. Athletes across multiple age groups from 25 to over 100 got the opportunity to compete for medals and records straight after Europe’s elite. Our challenge was to create a Masters Medal which shared the same creative DNA as the Elite Medal whilst remaining distinct and different. We opted to create a one piece design with ribbon bar in the traditional position and a flattened version of the ‘pringle’ form below. The die cast polished medal body features the tournament logo set in a contrasting satin recess. 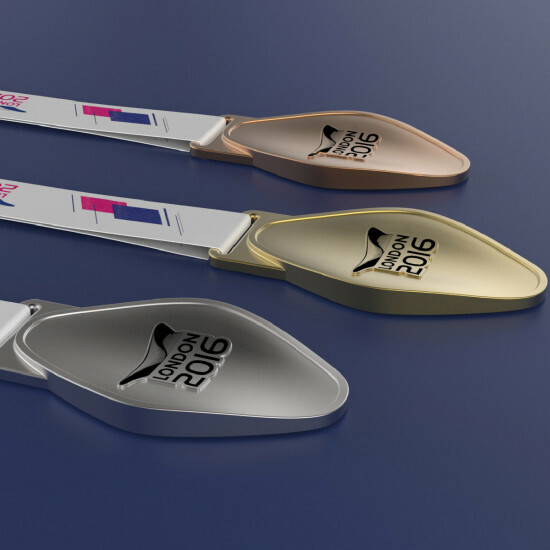 The image shows an early ribbon concept in white which gave way to the pink and blue design adopted for the finished medals. Athletes who have proudly earned their medal after years of intense training will naturally want to show it off, so it’s important the medal looks as good from the back as it does from the front. This one is no exception. You can see that the ribbon colour is reversed to further differentiate from the Elite Medal; small details – but they all matter in the context of the event. 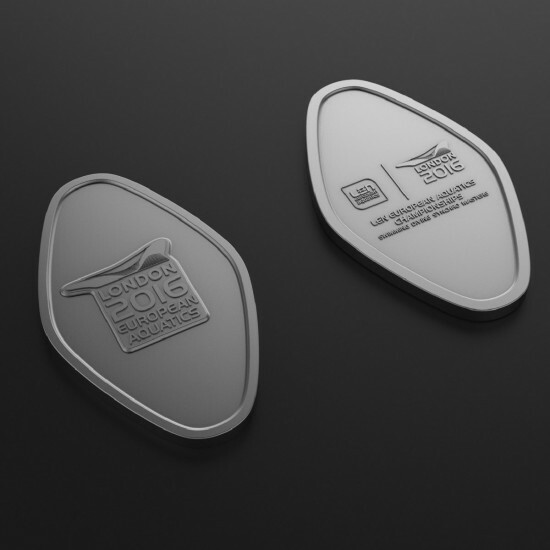 As part of the medal programme, we were asked by the organisers to create a Commemorative Medal suitable for retail through their merchandising channels. To continue the design theme, this medal shares the same rhomboid form but has a flat body like a collector’s coin. It is finished in a smart gunmetal plate to set it apart from the competition medals. We were asked to come up with ideas for the Championship Trophy to be presented to the top performing athletes representing Swimming, Diving and Synchronised Swimming. The design process rarely takes a linear path and a number of concepts were put forward, analysed and rejected. After considerable deliberation the final design was agreed. Ideas generation, rejection and selection are a key part of the service we offer clients. 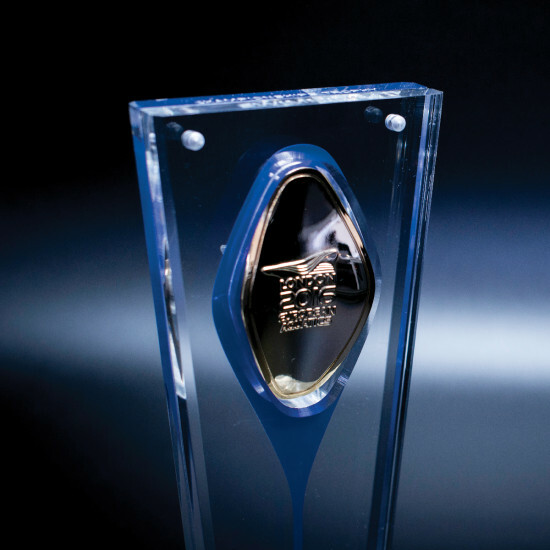 The final trophy design took the form of a solid machined acrylic pillar encapsulating a blue ‘puddle’ element in the centre. A gold Elite Medal set into a machined recess in the front provides a stylish touch. Offering a full spectrum service is very much part of the service we provide our clients. 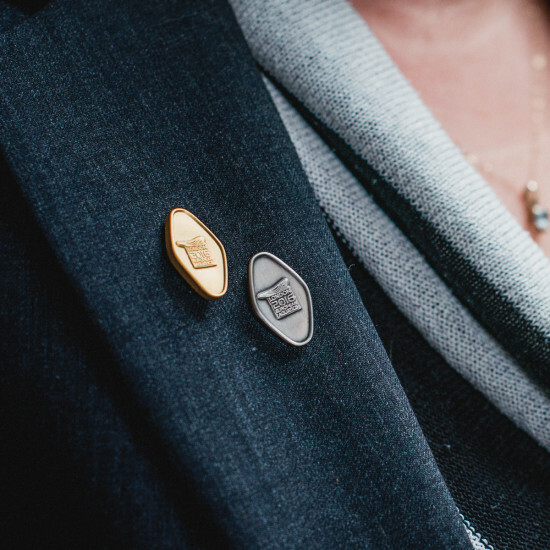 Pin badges are very popular merchandise at all major sporting events and we were pleased to be asked to provide designs.